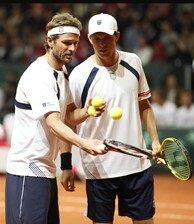 Mike Bryan and Mardy Fish clinched the tie for the U.S. over Switzerland in the doubles rubber. HOUSTON – All three members of the U.S. Davis Cup team who won live rubbers during the first-round sweep over Switzerland have committed to play the 2012 US Men’s Clay Court Championship in Houston. The tournament will feature Mardy Fish, John Isner and Mike Bryan, April 9-15, at River Oaks Country, one week after the U.S. visits France in the Davis Cup quarterfinals. On clay in Fribourg, Switzerland, Fish led off the U.S. Davis Cup triumph with a 9-7 in the fifth-set win over Stanislas Wawrinka on Friday, and Isner followed with a four-set win over world No. 3 Roger Federer. In Saturday’s doubles rubber, the U.S. secured the win, as Fish and Bryan teamed up to defeat Federer and Wawrinka. "It was an inspired performance this weekend by the Americans," said US Men’s Clay Court Championship Tournament Director Van Barry. "Road ties are always challenging, and this team showed great resolve in defeating the Swiss. It certainly gives us a very high expectation of the type of tennis we expect to see when these players come to Houston to compete for our national championship on clay." Fish, who is ranked No. 8, has been the top-ranked American for nearly every week since taking over that position last year at River Oaks. He won the title at the 2006 US Men’s Clay Court Championship. Isner is a two-time US Men’s Clay Court Championship quarterfinalist. This week, Isner picked up three spots in the ATP World Tour rankings and is now at a career-high No. 14. Last year in Houston, Isner reached the US Men’s Clay Court doubles final with countryman Sam Querrey, a former finalist at River Oaks who has also committed to play in 2012. Bryan was without his usual partner, as twin brother Bob was at home with his newborn baby. The Bryans will reunite in time to return to Houston, where they are four-time champions of the US Men’s Clay Court Championship. It’s not too late to purchase individual-session tickets and the very popular "Champ Pass" for the 2012 US Men’s Clay Court Championship! The Champ Pass includes a ticket to the Friday, Saturday and Sunday sessions, which are usually sold out before the tournament begins. Information on tickets can be found at www.mensclaycourt.com or by calling 713-874-6294. The 103rd competition for the US Men’s Clay Court Championship will be held April 9-15, 2012, at River Oaks Country Club in Houston. Started by the USTA in 1910, the Clay Court Championship has been held at numerous venues around the country. The tournament has been held in Houston since 2001 and will be held at River Oaks Country Club for the fourth straight year. Prior to hosting the US Men’s Clay Court Championship, River Oaks Country Club hosted its own event, The River Oaks International. Started in 1931, the River Oaks International roster of former champions includes Jack Kramer, Tony Trabert, Rod Laver, Roy Emerson, Ken Rosewall, Ivan Lendl, Guillermo Vilas and James Blake. The 2012 US Men’s Clay Court Championship will be the 78th tournament at River Oaks, with the club hosting a tournament every year since 1946 after a four-year lapse due to the war. More information is available at www.mensclaycourt.com or on Twitter at @mensclaycourt.